Untouched Tropical Jungle Full of Wildlife Awaits! National Geographic has deemed Corcovado National Park as one of the most biologically diverse places on Earth! The tranquility, solitude, and inherent beauty of Corcovado Park is absolutely breathtaking, and on this full-day tour, you’ll have the opportunity to hike, swim, and explore nature at its best. You leave early from Punta Uvita Beach to take a 1.5 hour boat ride to the park. Along the way, you might see pods of dolphins playing, sea turtles, or even whales if the season is right. Once you arrive, you will hike two separate trails: first a 2- to 2.5-hour trail and then a 1.5 hour hike. The first hike is focused on wildlife. 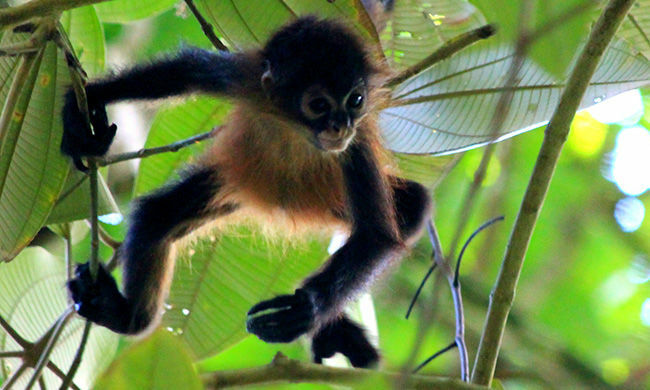 Your expert naturalist guide will help you spot animals in the distance that are not easy for the untrained eye, with opportunities to see howler monkeys, scarlet macaws, raccoons, kingfishers, and more. After your first hike, you will enjoy a picnic lunch. The second hike is highlighted by a visit to the waterfall. The trail is located near a river where you might see some water birds and reptiles. You will also have a chance to dip into a small but incredibly refreshing waterfall before you head back to Uvita. This tour is perfect for families, as well as individuals who enjoy nature. Both trails are relatively easy and flat, but in some areas they are covered with tree roots, and it can be muddy during green season. Your tour includes: boat transportation, captain, bilingual guide, picnic lunch, park entrance fees. Remember to be at the dock 30 minutes prior to scheduled departure! What to bring: camera, sunscreen, insect repellent, sunglasses, towel, poncho in rainy season. Wear a swimsuit and closed shoes for hiking.